Kornati islands contain up to 147 islands and islets among which is the island of Kornat. It is the largest island within this group of islands. It is 25, 2 km long and 100-2400m wide. The second largest island is Zut. This group of island was formed at the end of the Ice age and its first inhabitants were the Illyrian tribe of Liburn. The legend says that the gods created the Kornati group of islands out of the stars’ tears, and that they gave the shiny blueness to caress the sea. From the air, this archipelago of countless islands really does seem as fresh pearls dispersed over glass floor. Two objects were built on the island of Kornat in the 6th century, which are extremely important for the history of mankind. The first one is the fort Tureta which is located on top of a field and served to oversee the sailing path through the Kornati canal. The other one is the St. Mary’s church. The Kornati national park does not include the entire group of islands. it mainly cover the area of 89 islets and cliffs. This is the only national park the property of which is entirely private. The Kornati national park was founded in 1980 due to an increasing number of tourists. There are 25 restaurants and taverns in the National park, which offer quality homemade food, sea food and the Kornati lamb. Vrulje is a bay on the island of Kornat which is commonly referred to as the capital of Kornati because it contains around 60 houses the owners of which come there during the holidays to collect olives. Even though the island of Kornat seems like a desert, it is teeming with life. As far as 537 plant species have been found on the island, and it is presumed there are 200-300 more. The Animal world on the island is not fully explored. Next to the rodents, snakes and insects there is one other beast present on the island – beech marten. If you come and visit the Kornati islands, do not miss to visit the rich natural heritage, the “crowns” (cliffs facing the open sea), viewpoints, the underwater of the Kornati islands. 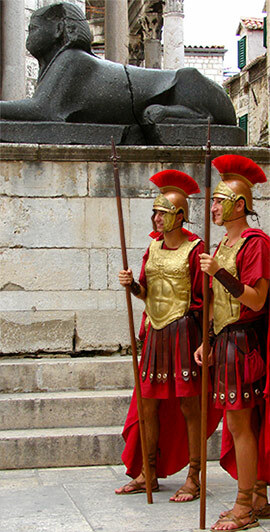 Visit the Illyrian forts, early Christian basilica and the church of Our Lady of Tarca, Turet fort, remains of the salt warehouse and the submersed salt factories in the Lavsa cove, remains of the Venice castle, as well as the biggest Kornati attraction – laborers and shepherds huts. You can reach the Kornati islands with a private boat or on tourist tours leaving from Murter. The great Irish poet, George Bernard Shaw, upon his visit to the Kornati islands, wrote: “"On the last day of the Creation God desired to crown his work, and thus created the Kornati Islands out of tears, stars and breath”.